Just in time for Hanukkah and Christmas shopping, the Target + Neiman Marcus Holiday Collection will be in stores on December 1. The umbrella collection is the creative genius of 24 CFDA members (Council of Fashion Designers of America). Ranging in price from $7.99 - $499.99, a lot of the items are more than I'd typically spend at Target, but the limited edition collection actually appears to be worth the higher price tags. For the full lookbook, click here. Alice + Olivia, Altuzarra, Band of Outsiders, Brian Atwood, Carolina Herrera, Derek Lam, Diane von Furstenberg, Eddie Borgo, Jason Wu, Judith Leiber, Lela Rose, Marchesa, Marc Jacobs, Oscar de la Renta, Philip Crangi, Prabal Gurung, Proenza Schouler, Rag & Bone, Robert Rodriguez, Rodarte, Skaist-Taylor, Thom Browne, Tory Burch and Tracy Reese. 1) I adore this luxe t-shirt from Tracy Reese... I could wear this myriad ways to bring the cost per wear of a $79.99 t-shirt back down to earth. 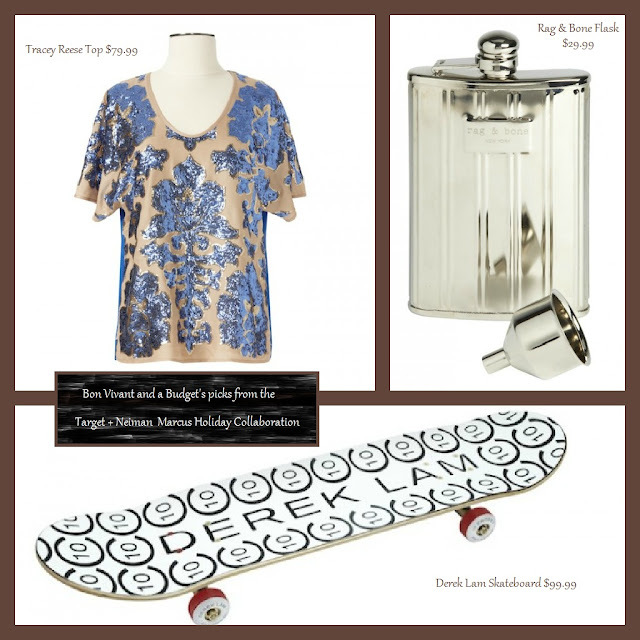 2) I'm actually envisioning a well-dressed man with a sharp blazer carrying this flask in his pocket... this would be the perfect gift for a dapper boyfriend or husband... and it's only $29.99 3) How cool is this skateboard from Derek Lam?! I'm going to go out on a limb and say this will be one of the first items to sell out on December 1st and we'll find it on eBay for like $1000. 4) I love Tory Burch's use of geometric prints and vivid colors, but I always find her stuff to be super expensive. If you're a heavy coffee or tea drinker, this $24.99 thermal drink mug would allow you to tote your warm beverages in style without breaking the bank. 5) This Lela Rose dress looks like it will flatter virtually every body type. It's no wonder the designer is a favorite of First Lady Michelle Obama, but her elegant dresses often retail for $1,200+, so this is really a score for $99.99. What is your favorite piece from the collection? What has been your favorite design collaboration to date? This is awesome Helene! I had no idea about this. Will mark the day in my calendar. 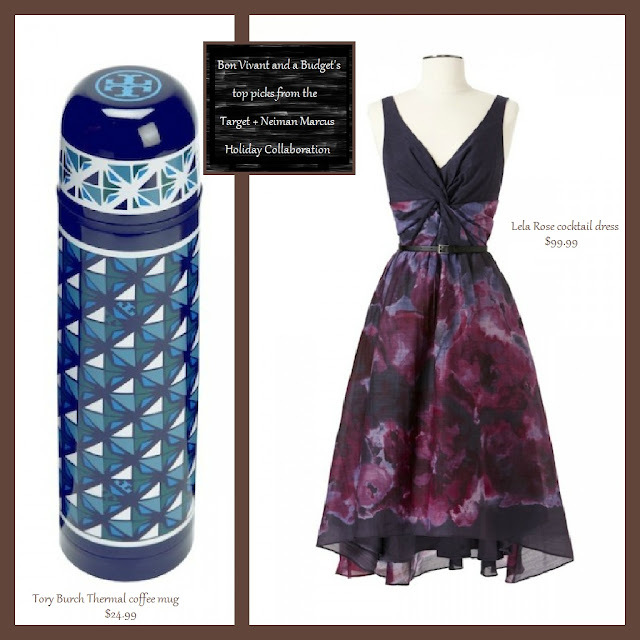 I also like the Tracy Reese top and the Thermal Coffee Mug.